I'm sat here pondering the significance of VAT being lowered temporarily to 15%, wondering if/how that is going to persuade folks to spend money the way the government want them to and if we aren't just storing up a whole lot more trouble for later. Tax cuts are one thing, but not if the deficit they provoke means tax hikes for years to come - but then, I'll admit to being largely ignorant of the world of big finance. There was little sign of reluctance of people to spend money at the weekend, as we took to Coventry's high street to tackle the bulk of our Christmas shopping. A lot of the stores seemed to have sales of one sort or another on this weekend which Coventry's populace was out in force to take advantage of. There were people everywhere and the queues were frighteningly long, but in the end, after a day of fighting our way through the crowds, we just about finished tackling the list. The rest of the weekend was spent wading through housework and trying to finish outstanding projects. I washed and blocked the wrap I've been working on, then spent some time staring at the cotton bag, started way back in July. It just looked too plain. 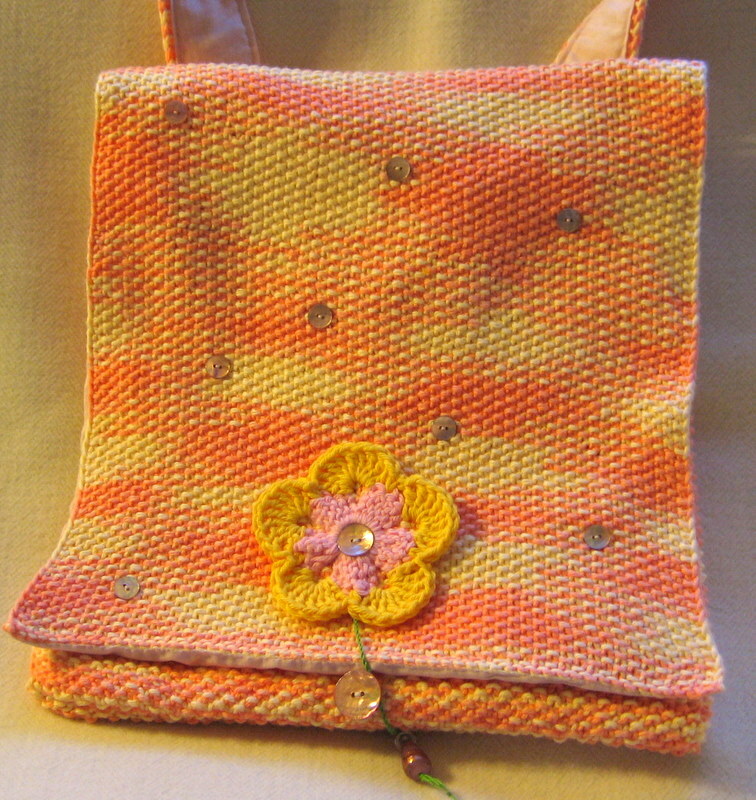 The yellow and orange of the bag fabric weren't gelling for me and the bag just looked unfinished. In the end, I decided to scatter some buttons across the front flap to see if they tied things in and after some more careful consideration, it seemed to be the thing to do. 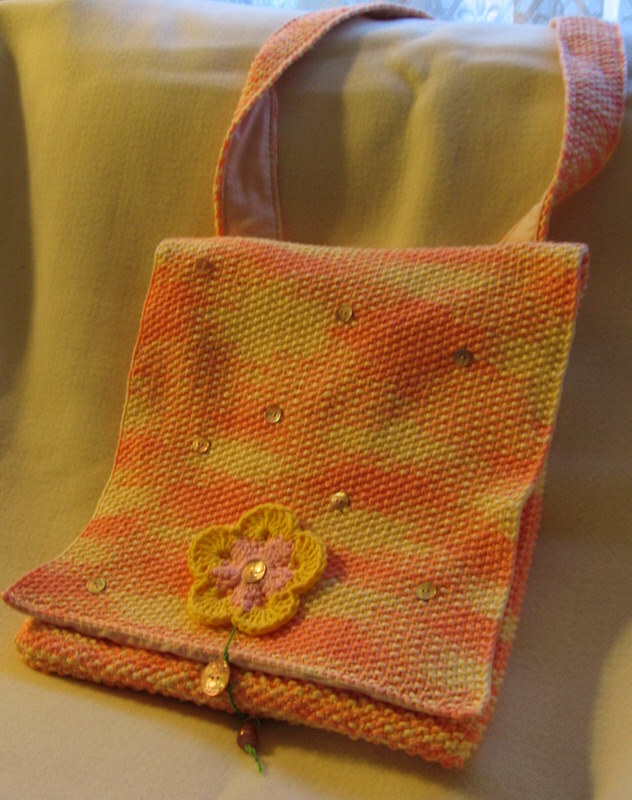 This bag is loosely based on 'Flora' published in Let's Knit magazine. I say loosely based, because other than the inspiration, I've changed pretty much everything. 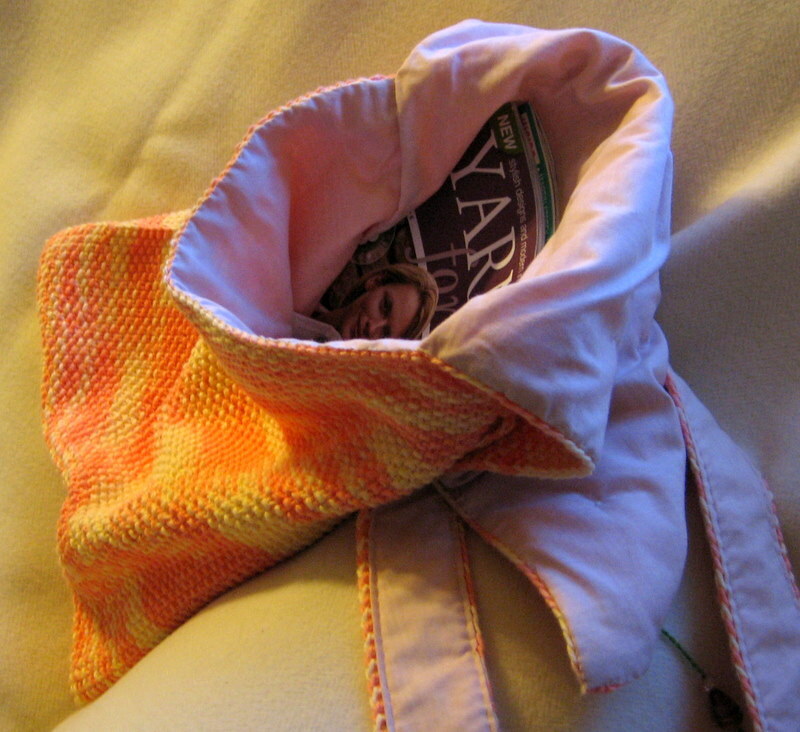 The bag was supposed to be knit using moss stitch stripes, as a fold over bucket bag. I decided against the stripes as I wanted to use up stashed Peaches and Cream cotton, which (as you can see) was already very busy. The bucket bag meanwhile, was originally intended to be knit as a huge square and then folded in half lengthwise. 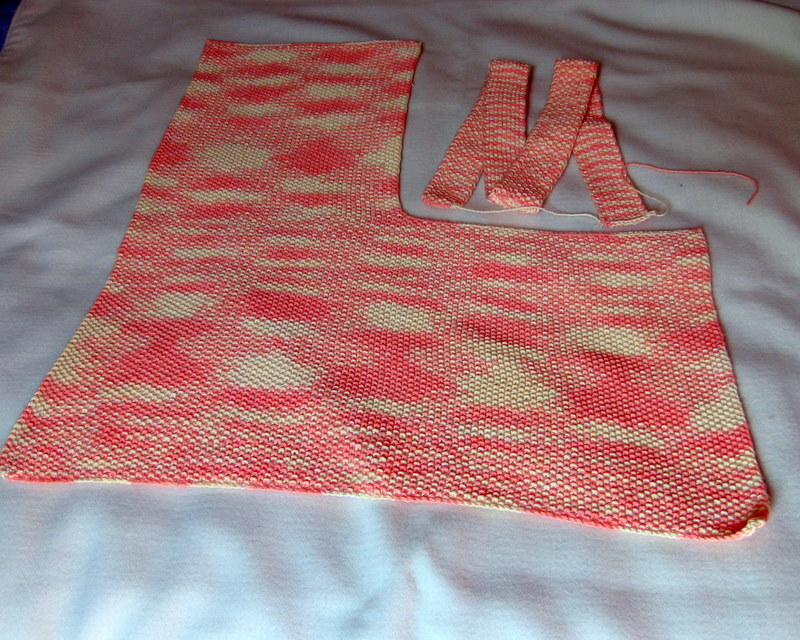 This fell by the wayside when I lost the will to live half way through and decided to knit a large 'L' shape instead. 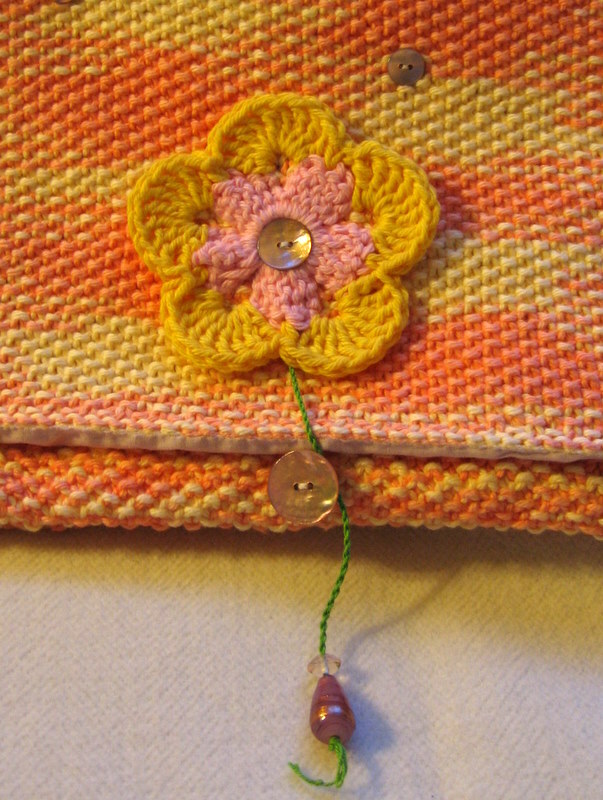 I kept the idea of a flower on the front of the bag, but didn't like the knitted one depicted by the designer so switched it for one from Crochet Inspiration. The method of fastening the flap remained the same, being what drew me to the bag in the first place. It's a traditional method that I've only seen on re-enactment items before; two buttons with a cord sewn under one button and wrapped around the other. The cord is held in place by friction and gravity, aided by adding a weight (i.e. beads) to the bottom of the cord. In this case, I made a 'S' twist cord out of perle cotton and threaded on a couple of beads from my stash attached it as the 'stem' for my flower, as per the original design. Finally, again differing from the original instructions for this bag, I decided to line it to minimise stretching. 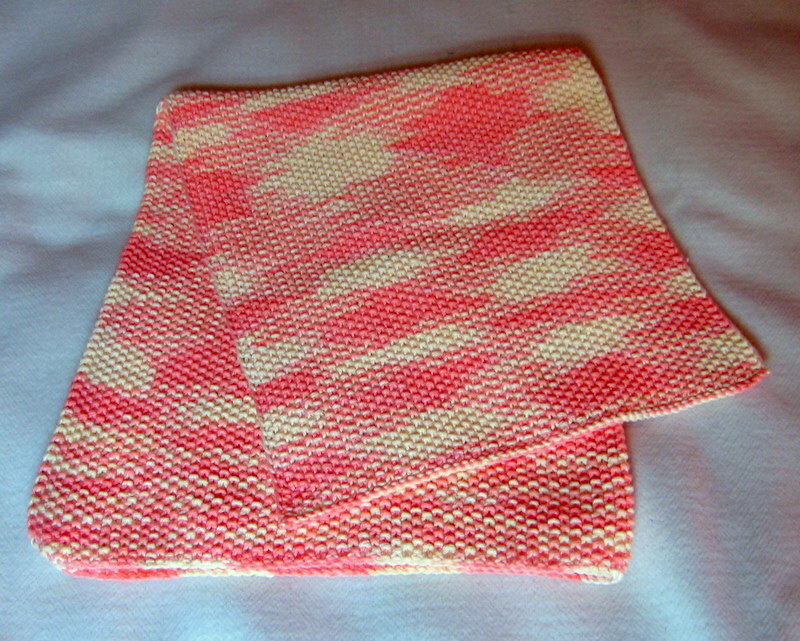 I scoured my stash until I found a suitable piece of pink cotton and used the finished knitted fabric as a pattern. Unfortunately, between measuring the unsewn bag and sewing it up, the knitted fabric relaxed meaning that by the time I got around to sewing in the lining, it was suddenly too big for the bag. I tried re-blocking the flap, but no matter how much steam I threw at it, the cotton kept shrinking back to its new size. I considered taking the lining out and starting again, but given how long I've been working on this bag and that it's an intended Christmas present, I wasn't keen, besides which the main problem seemed to be the lining seperating from the flap. The only way I could see to fix it would be to use iron-on interfacing to permanently stretch or stabalise the knitted fabric, which kind of defeats the point of using a knitted fabric entirely. This was my ulterior motive for attaching random buttons to the front of the bag's flap, I was borrowing on an idea from making quilts, where you sew through the multiple quilt layers at intervals, anchoring them together and sometimes, placing buttons at these anchor points. The decorative shell buttons (picked up from the Singer shop in Coventry) are not only pretty, they're helping to stabalise the lining on the back of the flap. Overall, I'm happy with the finished result, but most of all, I'm happy that I finally finished this bag as it was turning into one of those projects which never seems to be done! But here we are... It's bright, cheerful, girly and completely at odds with the season. Finally. The buttons work and I would say your last sentence of this post describing the bag is spot on. Was this a 6 months project?